May 29, 2014 – The wait is almost over. Mario Kart 8 hits the Wii U eShop at midnight on May 30! Ittle Dew also drops on the Wii U eShop. Mega May concludes with the release of Mega Man Xtreme 2 on the 3DS Virtual Console, and Klonoa: Empire of Dreams hits the Wii U Virtual Console. There's more to check out, so be sure to hit up your favorite digital storefront today at noon eastern for all of this week's updates! Nintendo Download: March 12-18, 2015. 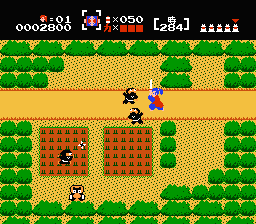 I'll be picking up Mysterious Murasame Castle off the European 3DS eShop right now! Would have preferred playing it on my TV, but I've been dying to try that game for the longest time, so I won't complain too much. Gotta pick up Xtreme 2 to complete the Mega May collection! My body is ready to finish up Mega May. As it just so happens, Xtreme 2 is the only Mega Man game for Gameboy that I've never finished before. I wanted to point out something; there is a small update available for those that own Tomodachi Life: Move-In Edition. I have no idea what it does, but you will be prompted to do the update when you launch the game from the HOME Menu. I liked the GB MM games. Should I get Xtreme 1 and 2? Are they "different" enough from their console big brethren that they're worth picking up, or are they more like downsized ports? It's weird to think tha today is the last day that Mario Kart 8 will not have been released in the US. @TriforceBun Can't speak for Xtreme 2 (yet), but the first Xtreme is very much a downsized port. 99% of it is GBC-ized pieces of Mega Man X and X2. Same level designs, same enemy placements, same boss patterns, same secrets. There are minor, blink-and-you-miss-it alterations (mostly just compacting into the smaller resolution), a weird new story, and a couple crappy new bosses. But it's definitely not unique to the extent of the GB games and their remixed stages. That said, Xtreme plays quite well for a GBC downport of SNES games, and for that reason I actually think I enjoyed Xtreme more than the regular GB games. Looking forward to seeing how Xtreme 2 handles Zero. Still no Shovel Knight....how long could it possibly take to approve? It's been about a month since they submitted it. Well, I played little over an hour of Mysterious Murasame Castle, and I love it! I'm not sure it loves me, 'cause it keeps beating the hell out of me, but that doesn't change anything. It's like a more linear Zelda set in feudal Japan without the dungeons and puzzles, and the action cranked up to eleven. All that, a nice little Koji Kondo soundtrack and the type of colour schemes you can only find in 1980's Nintendo games. I really hope they plan to release this in the US as well, 'cause any fan of 8-bit punishment will want to give this a shot, I think. Now back to trying to reach the third castle without getting stabbed in the balls every two steps. @PogueSquadron Yeah I was wondering Shovel Knight, too. Maybe it hit some snags with one or more of its vendors, and Yacht Club wants to release on all platforms simultaneously? @r_hjort That sounds pretty fun, actually. I hope it comes stateside. If you're a Mega Man nut, then go for it. Especially if you have never played it before. As a fan of the series, don't you think you owe it to yourself to check out all the stuff they have to offer? I wonder what percentage of Mario Kart 8 players are picking it up at midnight tonight via download. The earliest I can get it is 9:30am tomorrow from GameStop. Not even sure when I'll be playing it (might wait for Nikki after work..sooo...like 7p...). I don't wanna get squashed online, even for a minute! I'm getting it at midnight. I have my eShop moneys all ready to go. This will put me over the top for a $5 coupon as well, which maybe I'll put towards Smash or Golden Sun: The Dark Age if/when that comes out on VC. I took a chance on Ittle Dew after reading that it was inspired by games like Zelda. So far I'm enjoying it although the controls could be better. Man, I want to try Ittle Dew and Klonoa: Empire of Dreams. But Mario Kart 8 just came out! And Tomodachi Life is less than a week away. And I still have to grind for the Elite Four in my Nuzlocke run of LeafGreen! And I wanted to finish Kirby 3D before Tomodachi Life came out. And will I ever start MGS2? All of these questions and more will be answered on the next episode of as the HoH turns! Apparently, 1001 Spikes is going to be available on the eShop today. Anyone played Ittle Dew yet? Like, today today? Or Thursday?